Protect your DNA from oxidative damage and improve cardiovascular health with Astaxanthin with Phospholipids 4 mg – 30 Softgels from Life Extension®. The presence of phospholipids in this dietary supplement helps your bloodstream absorb more astaxanthin‚ which is then carried to different cells in your body. Astaxanthin‚ produced by the microalgae Haematococcus Pluvialis‚ reportedly guards the cells of your body against free radical damage and also stimulates the immune system. It could potentially improve your cognitive health. This fat-soluble compound appears to be good for your eyes as well. It may reduce age-related eye conditions‚ avert any damage to its cells‚ and promote eye health. Astaxanthin in this dietary supplement from Life Extension® could potentially keep blood sugar levels within a healthy range and reduce low-density lipoprotein and triglyceride. It reportedly improves endothelial function and combats inflammation. By boosting mitochondrial energy in the heart muscles‚ astaxanthin may support powerful contraction of the muscles and keep away associated conditions. It may also fight fatigue and alleviate skin conditions. 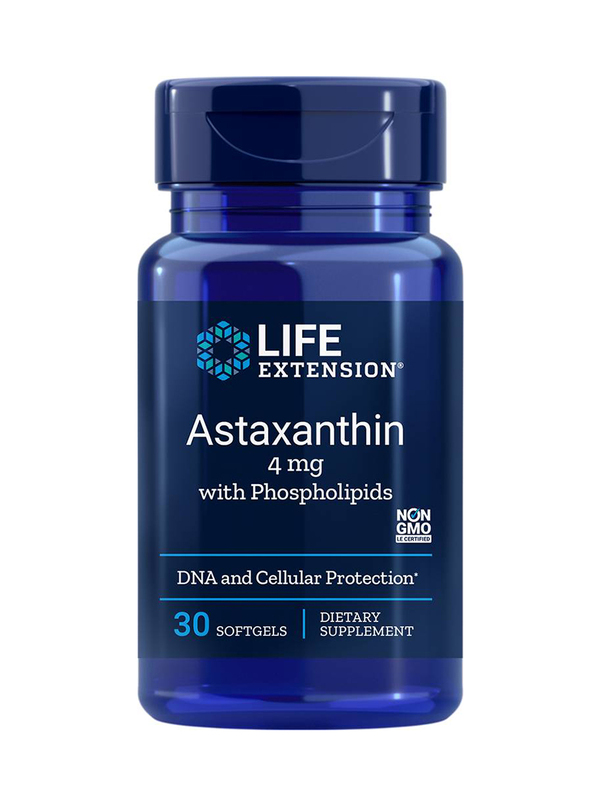 Include Astaxanthin with Phospholipids 4 mg – 30 Softgels from Life Extension® in your daily diet and it could potentially increase endurance and improve your cellular health. Other Ingredients: Soy lecithin‚ gelatin‚ sunflower oil‚ safflower oil‚ glycerin‚ soy fatty acids‚ purified water‚ dl-alpha-tocopherol. Take one softgel once or twice daily with or without food‚ or as recommended by a healthcare practitioner. Astaxanthin with Phospholipids by Life Extension is a great product at a reasonable price,,fast shipping.. I take Astaxanthin with Phospholipids everyday with my fish oil. It’s great for joint aches and supposed to really help with inflammation. I have noticed a positive change in my skin and pain levels. Also does help my migraine/head pain a bit. I don’t notice any negative effects from it and will continue taking it. I have been taking Astaxanthin with Phospholipids for a year already.